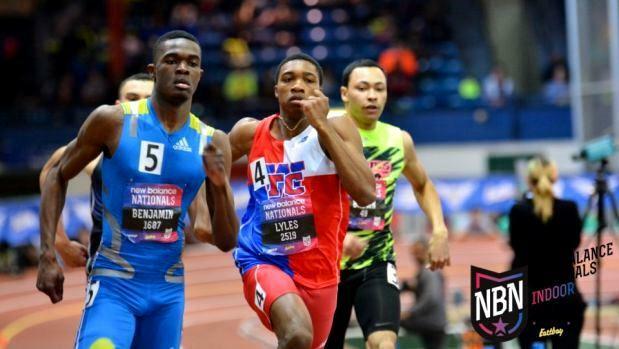 Rai Benjamin, who was third in the 400-meter run at last March's New Balance Nationals, set the current 300m meet record at the RI Classic with his winning time of 34.83. That record could be one of several to be broken at Wednesday's meet at the Providence Career and Technical Academy field house..
For anyone interested in watching some serious track & field during this Christmas Break, the upcoming Rhode Island Classic should offer plenty to whet the appetite. One record that could be in jeopardy is the 300-meter dash mark, set last year by Rai Benjamin of Mount Vernon, NY. On the flat, 200-meter oval at the PCTA last year, Benjamin captured gold with a record time of 34.83 seconds. Connecticut's Mark Doyley of Weaver has the speed to erase that one-year-old mark. He goes into Wednesday's race with a best of 34.90. He's the New England outdoor champion where he clocked a fast time of 21.16 for 200m. He was the runner-up for 300m at the Yale Track Classic last January and recently was timed in 35.14 with a victory in the event at the Hillhouse Invitational. Right now, it looks like his stiffest challenge could come from Laurence Leake of Huntington, N.Y., who has done 35.78 and was first at the recent Christmas Classic in his home state where he ran 36.23. Rhode Island's top speedster is Central's Donatien Djero, the defending 55m and 300m state indoor champion. Djero has a best of 36.17 for the 1.5 lap race. There's also East Providence's Alejandro Duarte, who owns bests of 36.34 for 300m and 49.10 for 400m. Doyley could be a double threat this week. He's also got strength in the short sprint. Last week at the Hillhouse meet he also won the 55m dash with a fast 6.28 clocking. That's a time that's well under the current meet record of 6.40 by Fred Gobewule of Shea (RI) in 2010. Kyshawn Bonner of Windsor, Conn. (6.47), and Kyree Johnson of Huntington, N.Y. (6.46), are the only other runners that have broken 6.5. On Saturday, Johnson won the 55m title at the North Shore Invitational. In addition to the individual events, the RI Classic features 11 relays. The girls' 300m title could be up from grabs. The top seed would have to be defending champion Sashana Hinds of Windsor, who could challenge the 2012 record of 40.18 be fellow Connecticut sprinter and All-American Precious Holmes, formerly of Hillhouse. Hinds is the reigning State Open champion and was third at the New England's last year. 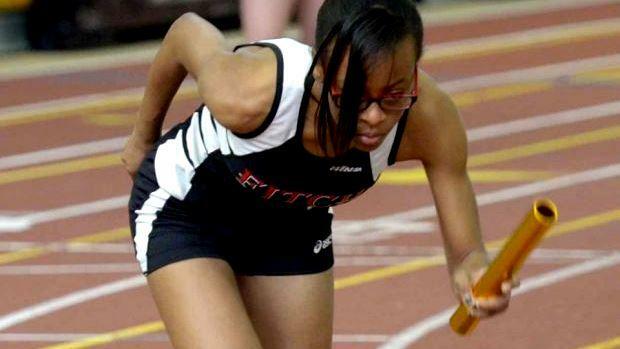 She also won the 300m at this Saturday's North Shore Invitational where she was timed in a US #15 of 40.44. Hinds also was first at the Hillhouse Invitational a week ago with a 40.85 effort. 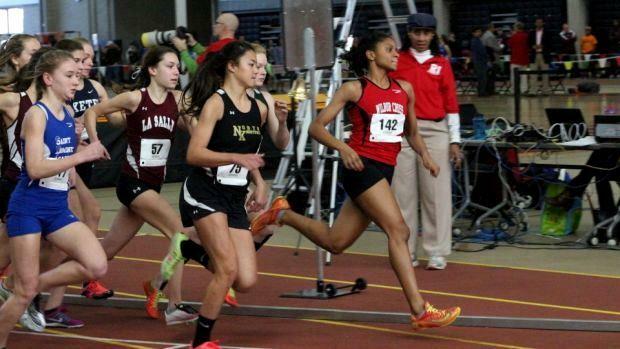 One runner that could surprise in the event is Gabby Curtis of Wilbur Cross (CT). Curtis's specialty is the hurdles. She was fifth in the 400m IH at the New Balance Nationals this past spring with a solid time of 1:02.67. She has a best of 46.48 for the 300m hurdles. What does that compute to without hurdles? We're guessing fairly close to 40 seconds. Another sprinter from the Nutmeg State, Windsor's JIanna Baker, could also contend. She has done 41.31 for 300m and ran a wind-aided 24.54 for 200m last year at the New York Relays. Hope's Isis Hack (59.98, 400m), Classical's May Stern (41.24, 300m; 1:38.22, 600m) and East Greenwich's Laura Murphy (42.49, 300m) are the fastest from the Ocean State. The favorite in the short sprint is Massachusetts' Brianna Duncan of Cambridge Rindge & Latin, who finished second at the New England Championship last year with a best of 6.98. If Duncan can match that effort, a meet and facility record will go down, the 2013 mark of 7.1 set by Kate Hall, formerly of Lake Region, Maine. Hall is the national outdoor record-holder for the long jump, another mark she also has at the RI Classic. Bloomfield (CT) teammates Cassidy Palmer (7.26, 55m, 25.63 200m) and Erica Belvit (7.39, 55m) and Baker of Windsor (7:26, 55m) are also possible threats to break the tape in the dash. The meet record of 4:18.32 for the boys' mile has potential to be eclipsed. La Salle Academy (RI) senior Jack Salisbury, who twice broke 4:09 last year is the top seed in the race. With its being an early-season meet, the chances of Salisbury coming close to his 4:08.76 indoor best, which he ran to place second at the New Balance Grand Prix, are slim. But with the level of competition, a time under the 2009 record of Bishop Guertin (NH) Francis Hernandez is certainly within reach. Salisbury's top challengers appear to be Jacob Johnson of Colonie, N.Y., Kevin Hazelwood of Brewster (NY) and senior teammate Matt Bouthillette. Johnson has done 4:11 and was sixth for 800m at the New Balance Nationals where he was clocked in 1:52. Hazelwood has a 4:17 best and Bouthillette, the defending New England champion, also has a 4:17 to his credit. The field will also include freshman phenom Sam Toolin of North Kingstown (RI). Toolin has proven he shouldn't be taken lightly. Last year as an eighth-grader he won the 1,500m at Junior Olympics Nationals where he ran 4:10. This past fall, he was fourth at the State X-C Meet and was ninth at the Nike Cross Nationals Northeast Regionals, a race he actually led at the midway point. A little more than a week ago, he ran a 1:59 anchor leg for his team's winning 4x800m relay at the RITCA Invitational. Connecticut has a legitimate chance to sweep the 800m races. In the boys' race, Mark Sheehan (CT) Griffin Cobb is the No. 1 seed based on his 1:56.99 best. He's also clocked 1:22 for 600m. Will Cobb be pushed enough to challenge the 2012 record of 1:56.94 by former Chariho Regional great Bryce Kelley? We'll see. Connor Garlton of Norwich Free Academy (CT), has clocked 2:33 for 1,000m and done two-minutes for 800m and Nick Fenton of Deer Park (NY) has also dipped under two with a PB of 1:59.35. He has also run 1:24 for 600m. William Witrock of Port Jefferson (NY) has a best of 1:25 for 600m and 52.19 speed for 400m. A year after winning the mile, Wilbur Cross All-American runner Danae Rivers will be looking to add the 800m title to her resume. Rivers is the overwhelming favorite with her 2:05 best. The odds on favorite for the girls' 800 title is Wilbur Cross's Rivers. Her all-time best of 2:05, which she did to win the New England outdoor crown. Rivers was also third in the event at the New Balance Nationals Outdoor Championship. Her best is about seven seconds ahead of her closest rival. Rivers rarely loses on home soil (or anything nearby) so don't expect it to happen here. Expect her to take the pace out hard and be comfortably ahead of the pack by the midway point. Both 3K races should be interesting. On the boys' side, Classical (RI) senior Joe Murphy, who has a best of 9:05, and Massapequa (NY) senior Aidan Smith, who owns a best of 9:33.72 for 3,200m, are the frontrunners. Don't count out Cumberland (RI) junior Ben Drezek, who was sick when he ran 9:24 for 3,000m at the RITCA. He's coming off a breakthrough cross-country season where he was sixth at the State Meet. Mercy (CT) junior Bridgid Selfors is the top seed in the girls' race. She has done 11:04 for 3,200m and 17:34 for 5K. Rhode Island's Claire Hanlon of Bay View and La Salle's Elise Papazian are legitimate top three contenders with best of 10:54 and 10:49, respectively. The past two years Lake Region's Hall has won both the 55m dash and the long jump. Her record of 19-11 for the long jump seems out of reach, but a 19-footer is still possible. Two of the athletes in the field have done 19 feet or better this year -Leah Moran of the Academy of Holy Names (NY) and Janai Skibitcky of Cheshire (MA). Moran did a wind-aided 19-11 leap at the Glenn D. Loucks Games last spring. Skibitcky has a best of 19-2. Another leaper, Leah Blackall of Sachem North, is on the cusp of 19 feet with a best of 18-10. The boys' long jump should be hotly contested with Windor's Tyler Coyle (22-2.25) and East Providence (RI) teammates Trystan Casey (21-7) and Paulo Pereira (21-9) among your leading contenders.